Forum Index > Off-topic Talk > Would like Hedge Knight custom sword made but who could? Posted: Mon 19 Jan, 2009 1:23 pm Post subject: Would like Hedge Knight custom sword made but who could? I've been looking for a sword for a long time and I just never seem to see one that I truly like so I want to have someone make a custom sword for me. 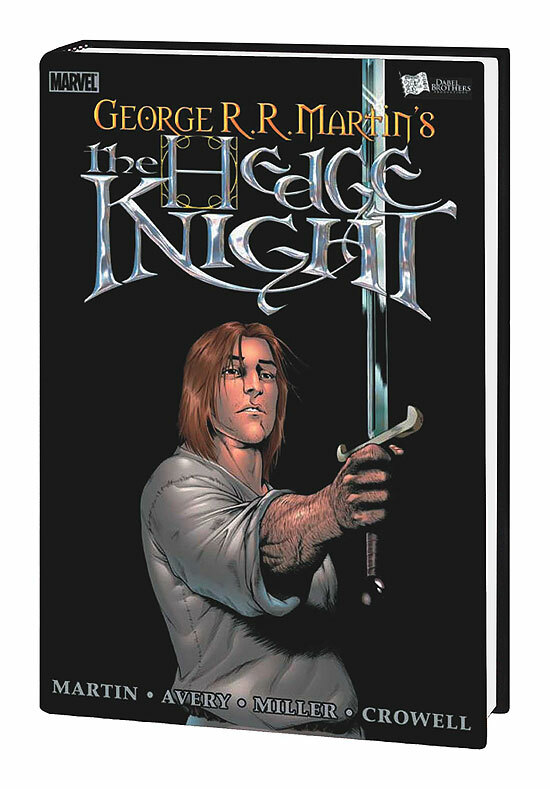 I really love the design of a sword out of the Hedge Knight comic by George RR Martin and would love to have someone make it for me but who? If anyone has any ideas on someone that would make that for around $1000-1500 for me please let me know. I tried contacting Ollin Designs but they won't return any of my emails. Please let me know thanks. I'd second the nod to Lundemo. I've never handled any of his works, nor have I read the Hedge Knight, but based on what I have seen of Mr. Lundemo's work, and through my reading of the Ice and Fire series, I would definitely think seriously about going with Odin Blades. They are known primarily for fantasy works, but have also demonstrated an ability to do historical pieces. I think a blend of history and fantasy would be perfect for a Westerosi Knight. I think that Ollin Swords would be up on my list as well, so I would advise you to keep trying to contact them. Ollin and Odin would be my two options if I were considering the project I think. Posted: Mon 19 Jan, 2009 11:50 pm Post subject: Re: Would like Hedge Knight custom sword made but who could? I tried contacting Ollin Designs but they won't return any of my emails. Please let me know thanks. They are usually reliable about answering e-mail but just in case there is some sort of problem with their service provider or your messages are being blocked by some sort of spam filter I would try giving them a phone call before giving up on them. Sorry to hijack the thread but has anyone gotten any email responses from the boys at Ollin lately? The last time I heard from them was mid-Deember. Ryan, any chance of posting a picture of the sword? I have not read the Hedge Knight but have read all of the Ice and Fire books and enjoyed them. Also, they may have been swamped or vacationing over the holidays. We won't know unless we ask though. More also, you could alway try a pm. I handled several Ollin pieces at Promethean and I thought them well worth the price. More also, you could always try a pm. That is reassuring to know although I had no specific reasons to worry, but I haven't had a reason to e-mail them in a while. Mark is working on a special project for me though. This time a walking stick with a bronze head inspired from Aztec mythology and art and a cane shaft that will be in steel and heat treated like a sword: Somewhat off Topic. Back on Topic: The guys at OlliN could certainly make a piece based on a comic book sword and make it work as a real sword if the design is not like one of those huge and impractical computer game ones i.e. if the customer listens to Mark's design suggestions at OlliN. Oh, if Ryan wants a full fantasy piece that would be impractical that is all right also as long as he make it clear what the design objectives or priorities are, or is himself clear about those objectives in his mind ). you could check out Brendan too. Fantasy is pretty much his speciality. coud be worth to at least talk to him. Hey Ryan, is there any chance you could post a picture of the sword? I haven't had a chance to get my hands on a copy, but I'd be interested to see what Martin has in mind. I sort of picture Westerosi arms and armor to represent sort of a hodgepodge of nearly the entire medieval period, and I'm curious as to exactly what you'd like to base your repro on. There's nothing fantastical about the blade; most of the pics inside show either a fairly typical XIIa, XVIa or XVIIIa (it changes slightly from drawing to drawing). Yes...got an email from them last Saturday. Good to hear they are alive and kicking. No rush on what I want to get in touch with them about so I am not overly worried.